First Line: At least he was well dressed. Wyndham is under pressure to solve the case before the streets of the city erupt into violence. He has two colleagues to help him: the arrogant Inspector Digby and Sergeant "Surrender-not" Banerjee, one of the few Indians to be recruited into the CID. When I first picked up A Rising Man and began to read, I read it as I would any other historical mystery. I soon fell headfirst into a major roadblock: the slow-as-treacle pace. Fortunately, before I gave up and moved to another book, I realized that the setting of this book is absolutely fabulous and well worth the price of admission. Mukherjee has written this book in such a way that readers get to see Calcutta in 1919 from several different points of view. It is a city-- and a country-- just beginning its quest for freedom in earnest. The vast majority of Indians do not wish to be a part of the British Raj. There are revolutionaries showing us why India wants its freedom. There are British bureaucrats who-- above all else-- wish to maintain their precarious status quo. There are Indians like Sergeant Banerjee who want the British out but want to learn how to govern and how to fight crime first. And into this mix comes Sam Wyndham, who's survived a long meat-grinder of a war with few illusions left. He's fought side by side with brave and honorable men of all races and creeds, so he doesn't always see situations from his superiors' points of view. And speaking of points of view, there are several that some readers may find uncomfortable. Once I settled down to read this book as historical fiction rather than as a mystery, I was much happier. Yes, the mystery is a good one, and Sam Wyndham is a finely drawn character, but it is the city of Calcutta that steals the show. 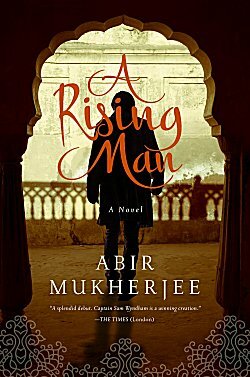 I'm looking forward to Abir Mukherjee's next book with a great deal of interest. I keep hearing about this one, Cathy. And every review seems to be a good one, or at least mostly positive. It was very much on my radar, anyway, and I really will have to move it to the wishlist. I'm glad to read your review and equally glad that you liked it. If I read it, it'll be because it's historical fiction rather than a mystery, as you say. I want to read it. It's just that the TBR mountain range is ridiculous. And every time I read a blog of book reviews, I'm going to the library's catalogue to reserve it. So I've already gone off my plan several times since Jan. 1. But it's fun. Yes, it is-- although I do try to have very few plans!